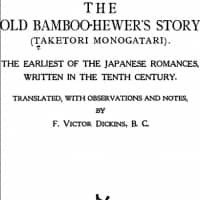 “Taketori Monogatari,” or “The Old Bamboo-Hewer’s Story,” is a fascinating piece of early Japanese literature, well worth the short read. Written in the 10th century, it is one of the earliest known Japanese prose narratives, and the story recounts the beloved folktale of the bamboo princess, Kaguya. The Old Bamboo-Hewer’s Story, Translated by F. Victor Dickins. The story is deeply ingrained and often recycled in the Japanese cultural imagination, whether in “The Tale of the Princess Kaguya,” a 2013 movie by Studio Ghibli or everything from the manga series, “Naruto,” to “Big Bird in Japan,” an American “Sesame Street” movie. 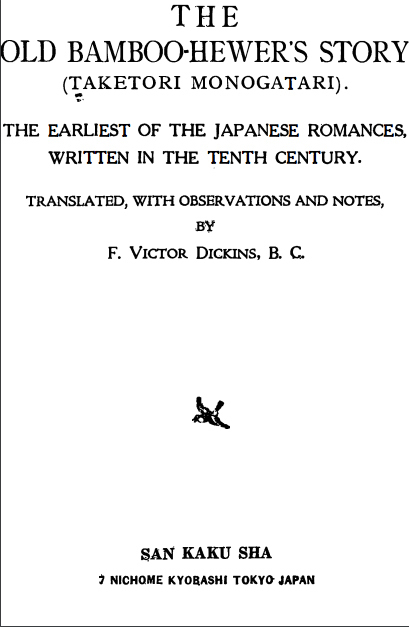 What sets the original translation apart is its language, evocatively translated by Frederick Victor Dickins (1838-1915) — a British medical officer on a ship in Yokohama, who learned Japanese and cultivated a lifetime of appreciation for its literature. The quaint story of a beautiful, mysterious maiden who cleverly resists all marriage offers, even from the Emperor himself, and eventually travels back to her homeland, the moon, has long captivated the Japanese sensibility, and his rendering reveals the tale in its original essence. Dickins’ translation captures the classical prose, with the traditional exchange of poems between Kaguya and her suitors penned in authentically romantic verse. His thorough notes and afterword also adds layers of meaning to the text. First published in English in 1888, “The Old Bamboo-Hewer’s Story” speaks of familial love and loss throughout the ages.